Zika has been the focus of talk worldwide. I have a couple of times talked about Zika virus previously. In the past 2-3 months, research has shot up on Zika. From a skeptic perspective of Zika's role in microcephaly, there is nearly a convincing evidence to show that Zika is neurotropic possibly in reduced immune context. Most of the questions are unanswered at this point of time. I don't have an exact information of global statistics in terms of numbers. 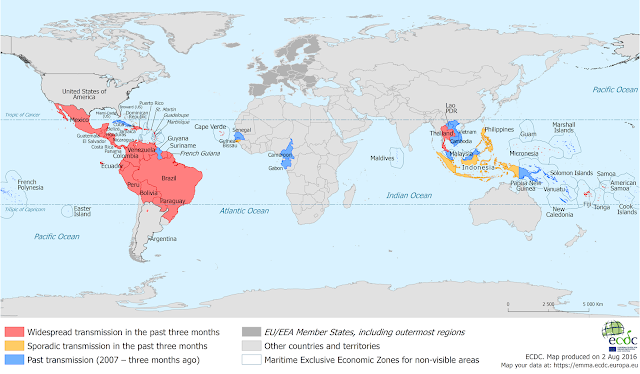 Fig 1, obtained from ECDC shows that Zika is potentially spreading into more parts of the world. Brazil seems to be the most affected though the trend shows a decline in a number of cases. As of 28 July 2016, WHO has reported 64 countries and territories with a mosquito-borne transmission. of these 14 countries have reported microcephaly and other CNS malformations potentially associated with Zika virus infection in a congenital context. Colombia had approximately 1,00,000 people suspected of having contracted Zika, with roughly 18,000 pregnant women constantly being medically monitored. More than 20 cases of microcephaly were reported. Colombia declared the end of the Zika epidemic on 26 July 2016. "Much of sub-Saharan Africa (where several sporadic cases have been reported since the 1950s) also presents an environment that is highly suitable for the Zika virus. While no cases have yet been reported in India, a large portion of the subcontinent is also suitable for Zika transmission." India is already testing for Zika. Soumya Swaminathan says, "India, at the moment, for Zika, what we are doing is surveillance. Making sure that we equip our labs to be able to test for Zika. We want to find out if there is any Zika circulating. So, we are testing people who present with fever, just like a dengue but a dengue negative. We have not found any case so far, but we will continue this exercise." I'm a little skeptic about this approach. Worldwide people have shown that Zika is serologically cross-reactive with dengue and other flaviviruses. In a country where serology is mainly the mode of diagnostics, it would make more sense to me to perform molecular Zika tests, in cases where dengue serology is positive. There is also a great need for field testing of trapped mosquitoes for Zika which would signal an alarm. 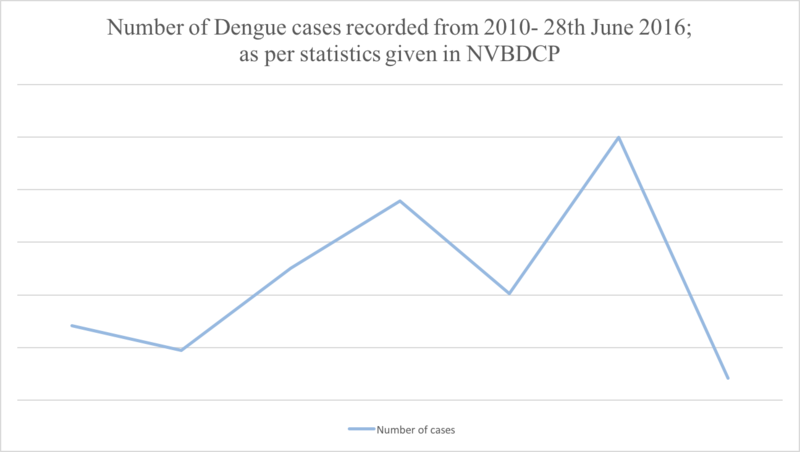 Fig 2: Dengue case statistics in India. I just looked into the number of dengue cases reported in India. 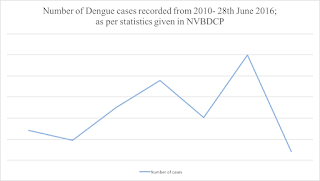 If there is a sudden increase in dengue cases reported and we argue that some of them are actually Zika that we are misdiagnosing then we would still see some increase in dengue cases. But that is not what I see based on statistics data. But of course, you could argue that Zika doesn't become clinically relevant in most of the cases and hence my argument may not be totally valid. There is almost nothing known about Zika molecular life cycle. The cellular receptor is not known. There is some research evidence to suggest that DC- SIGN, AXL, Tyro, and TIM-1 entry/adhesion factors permit the entry of ZIKV. ZIKV replication also activates an antiviral immune response and the production of type I interferon in infected cells. Mouse and macaque models show that indeed ZIKV significantly affects fetal development leading to microcephaly. There is a lot of debate on if ZIKV is sexually transmitted. There are 4 reports that suggest that ZIKV is sexually transmitted. But the results and data are not quite convincing and there is a lot of debate on what are the chances. There are also a couple of reports suggesting blood transfusion as another possible risk. The only universally agreed upon mode of transmission is mosquito borne. Another discussed point is the Zika transmission with reference to Olympics. Rio de Janeiro and the five sites outside the city are in areas where Zika-bearing mosquitoes can thrive. 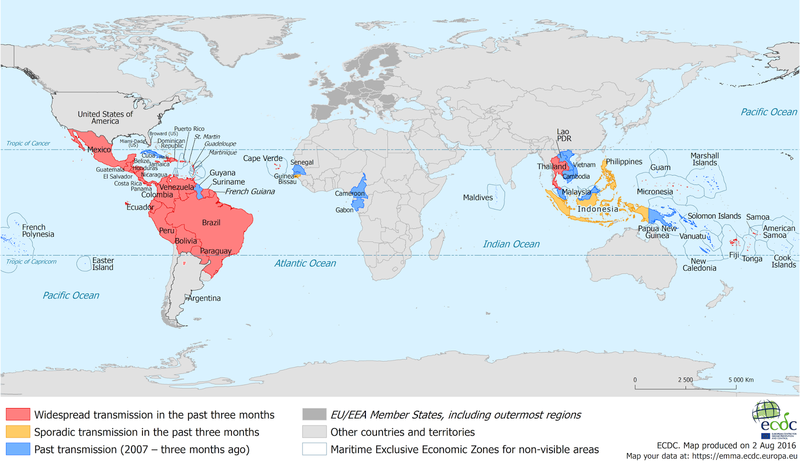 According to recent opinion, the risk of global transmission of ZIKV from Rio due to people attending Olympics is low. Though the estimate is not null, the number of people that would travel to the Olympics is going to be really a low number. Also, statistics show that the number of cases in Rio has come down significantly. As Paulo Gadelha comments, “Several simulation studies show that the expectation of contamination is 1.8 cases per one million people. This is a very low risk". The authorities are taking steps to minimize mosquito bites. Fig 3: Model of ADE in dengue infection. The greatest challenge in ZIKV is making a vaccine. ZIKV, like other flaviviral members, exhibit a property called as ADE (Antibody dependent enhancement). This is a phenomenon where viral entry occurs when Fc receptors on the cell surface bind to the antibody that is attached to virus particles. The result is higher levels of virus replication and more severe disease. This phenomenon is called antibody-dependent enhancement, or ADE. This phenomenon is well known in Dengue where infection for the second time causes severe problems. This is why making a vaccine against dengue a problem. Interestingly, due to cross-reactivity presence of Dengue antibodies increases the susceptibility to Zika (Link). I recommend you read Vincent's blog post here and here which has a great explanation of details. Though there are several candidate vaccines proposed as a possibility, there isn't any approved vaccine to date. As discussed above the vaccine will have to circumvent the problem of ADE and also not cross-reactive enhance other infections especially Dengue. Barouch et al; has published a DNA vaccine candidate. DNA vaccine expresses full-length ZIKV pre-membrane and envelope (prM-Env). The full-length prM-Env DNA vaccine has shown complete protection and protective efficacy correlates with Env-specific antibody titers. A single immunization with a plasmid DNA vaccine provided a complete protection in susceptible mice against challenge with a ZIKV outbreak strain from northeast Brazil. NIH will soon be leading a clinical trial. Another vaccine that has received approval for phase I study is the Inovio DNA vaccine. Earlier studies have shown that their vaccine induced robust antibody and T cell responses in animal models. The phase I, open-label, will study 40 healthy subjects for GLS-5700 (Inovio ZIKV DNA vaccine) planned to be administered intradermally using Inovio’s proprietary DNA delivery device system- Cellectra. The laboratory diagnostic capabilities have tremendously increased for ZIKV. There is RT-PCR using specific primers, and an RNA detection platform on filter paper. Serological testing methods such as ELISA is also available. PRNT (Plaque reduction neuralization test) is currently the gold standard. To summarise, Zika is not evident in most cases which may serve as a carrier. The problem is evident in a subset of pregnant mothers where fetus is affected for which we dont know how and why. There are no vaccines approved to date and tropical countries are at risk. The strain is slowly spreading thanks to global travel. I missed to state that there is another vaccine being developed by Walter Reed Army Institute of Research in association with NIAID (National Institute of Allergy and Infectious Diseases). The vaccine is a purified, inactivated Zika virus from Puerto Rico. Preliminary results are encouraging. 2. Messina J, Kraemer M, Brady O, Pigott D, Shearer F, Weiss D et al. Mapping global environmental suitability for Zika virus. eLife. 2016;5.